In the wake of China's deadly H7N9 avian flu outbreak, the idea of waking before dawn to track down wild birds might not sound appealing to many people. 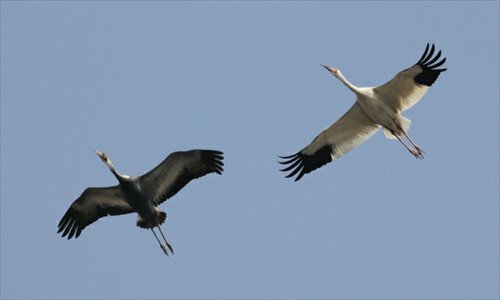 But for Beijing's birdwatching enthusiasts, spring ushers in one of the best times of the year to spot migratory birds. More than 400 bird species have been recorded in Beijing, accounting for about one-third of the country's total. Like the city's workforce, most birds are migrants. 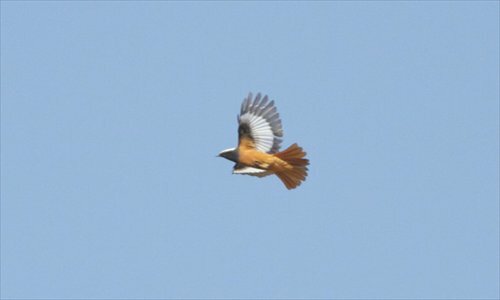 They flock north during spring for breeding, flying back south before the capital's bitter winter sets in. While most people would be hard-pressed to identify birds other than pigeons and sparrows in Beijing, venturing to the capital's rural outskirts reveals a hidden world inhabited by rare species including the Baer's pochard, Siberian crane and Baikal teal, to name but a few. Birdwatching, or "birding" as enthusiasts prefer to call it, has become increasingly popular in Beijing among Chinese and expats alike over recent years, despite its relatively late debut. Birdwatching can be done with the naked eye, although few devoted hobbyists leave home without a pair of binoculars or telescope. Despite its name, listening to and identifying bird calls is just as important as watching the creatures themselves. It became a recreational activity in the UK in the late 1890s, although didn't take off as a hobby on the Chinese mainland until around a century later. The UK's Royal Society for the Protection of Birds is the world's biggest birding association, boasting over 1 million members. In China, there are 36 birding societies and around 6,000 active birders nationwide, according to Zhang Zhengwang, an ornithologist at Beijing Normal University and president of the China Ornithological Society. The two major birding societies in Beijing are Friends of Nature and the Beijing Bird Watching Society. The latter has about 1,000 Chinese members, among whom 400 are active birders. The expat birding community is much smaller by comparison, with fewer than 10 active birders. The best urban spots for birding are the Summer Palace, Yuanmingyuan, the Olympic Forest Park and the Beijing Botanical Garden. 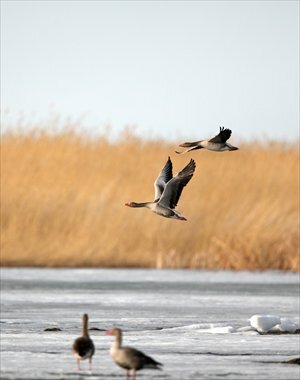 Further afield, outskirts wetlands and nature reserves including Wild Duck Lake in northwest Beijing's Yanqing county and Miyun Reservoir in northeast Miyun county and Lingshan Mountain in western Mentougou district, which is home to over 70 bird species alone, are popular rural hot spots. Despite the hobby's small legion of followers in Beijing, British birder Paul Holt insists birding here is more exciting than in his home country. "The birds of Beijing are still relatively poorly known, and it's easy to make 'discoveries.' It's exciting to learn when birds start to migrate, when migration peaks and when it ends. It's easy for even a modestly active birder to make a huge contribution," says Holt, 49, who first birded in Beijing in 1989. My first foray into birding began on a crisp mid-April morning at 5 am. My guide was British birder Terry Townshend, one of the most active expat birders in town. He wasted no time briefing me on the day's itinerary and the types of birds we hoped to see at Ma Chang, a horse ranch near the Guanting Reservoir and Wild Duck Lake Nature Reserve. "If we're lucky we could see oriental plovers," Townshend tells me, referring to a white-faced shorebird that migrates from Australia to Russia and Mongolia. 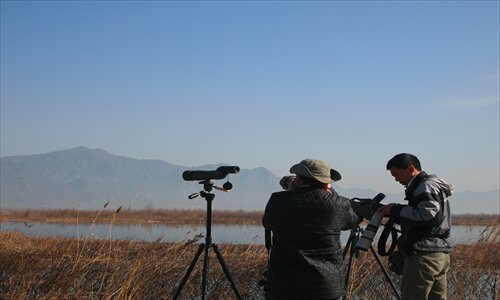 Since settling in Beijing in August 2010, the 42-year-old environmental lawyer has run the popular Birding Beijing blog, which provides updates on local birdlife and allows visiting expat birders to arrange field trips with Townshend. Joining us on the expedition is Hong Kong native Jennifer Leung, who began birding three years ago in Shanghai. During our drive out to Ma Chang, Townshend explains the necessity of waking so early; birds are most active and easiest to spot, particularly those breeding with bright plumage, during the morning. We arrive at Ma Chang, a deserted sandy plain during winter and popular horse-riding resort in summer, after an-hour long drive. Despite being a chilly -2 C, the clear, windless day offered good visibility. We soon spot a flock of oriental plovers about 50 meters away, which have recently migrated all the way from Australia. One of the important rules of birding etiquette is not to get too close to your subjects lest you scare them away, or to disturb other birders, as I quickly learned. Handed the binoculars, I adjust my eyes to focus on the plovers. Before I have time to properly focus, Townshend jots down the number and gender of the species into his pocket-sized notebook. "Grayish head and face, white lower neck, long legs," he says aloud, squinting into the distance. Eventually, I see what all the fuss is about: a 20-centimeter-tall male plover with creamy plumage elegantly trotting on its slender legs. We spot around 60 plovers in total, clearly a sizeable number given the high spirits of Leung and Townshend. Ma Chang hasn't let us down. After around 15 minutes of watching and taking photos, we drive further and pull over near the Guanting Reservoir. Even above the sound of the car's engine, Townshend's sharp ears detect the calls of different birds. "Do you hear the laughing sound? That's a gray woodpecker. That blowing-into-an-empty-bottle one is of a bittern," says Townshend, who began birding aged 5 at his childhood home in Norfolk. Awestruck, I ask Townshend how he acquired such discerning hearing. "It comes from training," he says, a modest smile creeping across his face. "There are guidebooks you can study and bird calls you can download from the Internet." One of the biggest attractions of birding this time of the year is courting. Townshend recalls how only a week earlier at Ma Chang he observed a sole male Baer's pochard, an endangered duck found in East Asia, trying to court several females of another species. "This lonely male threw its head back, stretched its neck high and bowed to several female ferruginous ducks and a slightly startled-looking female common pochard," Townshend writes on his blog. After eating a lunch of instant noodles, we pack the binoculars and notebooks and return to town at 2 pm. Having spotted 71 species including the newly-sighted addition of the Baikal teal, a small dabbling duck with a colorful head pattern, it was clearly a satisfying expedition. For the amateur birder, all you need are binoculars, a field guide and a notebook. It's best to start watching common birds, such as pigeons and magpies, before embarking on more adventurous expeditions, Townshend advises. The "birders' Bibles" for China are the comprehensive and fully-illustrated book Birds of East Asia (2009) by ornithologist Mark Brazil and A Field Guide to the Birds of China (2000) by John MacKinnon. "It takes a lot of time to make progress. Sometimes 'duck A' looks like 'duck B.' When you come back from birding, it's best to describe [birds] to people and show them pictures," says Leung, who often sketched species when she first started birding. Despite the rich diversity of bird species in Beijing, environmental problems have threatened their existence in recent years. The biggest concern is habitat destruction, says Zhang. "The city's rapid expansion and population growth has placed great pressure on wildlife and their habitats, which have worsened," notes Zhang, adding poaching is another threat pushing some species to the brink of extinction. Zhang estimates numbers of the common swift, a swallow-like bird that breeds in China, have dropped by about two-thirds compared to 30 years ago, with only about 3,000 in the city. While birdwatching is largely a recreational activity, conscientious birders have answered the call to protect rare species and support related government initiatives. The Beijing Terrestrial Wildlife Resource Survey, organized by the municipal landscape and forestry bureau, will kick off later this year and provide valuable data on rare bird species in mountainous and urban areas. The Beijing Bird Watching Society, founded in 2004, has also carried out a number of similar surveys and helped administrators of city parks and reserves provide artificial nesting areas to support breeding. For his part, Townshend has organized the "Help Save the Jankowski's Bunting" appeal to fund conservation efforts for the endangered species, which has seen numbers decimated by habitat loss in Northeast China. Currently, his appeal has raised £1,688 ($2,570) of a targeted £10,000.